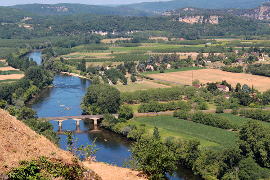 Carennac lies to the east of Souillac and Martel and is in the Lot department close to the boundary with the Dordogne department. 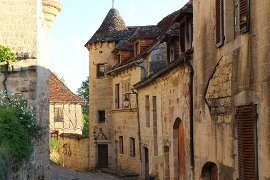 The river Dordogne runs through the village. 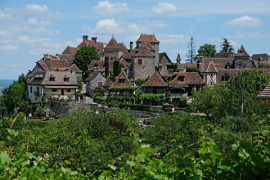 Carennac is officially classified as one of the most beautiful villages of France and it truly is delightful. 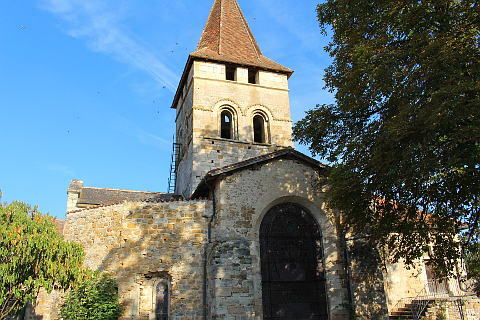 At the very centre of the village enter into the lovely 'Court du Prieure', a little courtyard with the Church of St Pierre and its cloister on one edge and, rather incongruously, farm buildings on the other side. 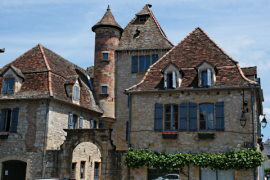 The tourist office is also here in one of the former appartments of the Deans. 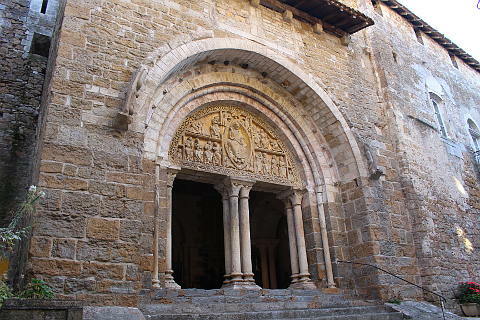 The church has a beautiful carved doorway and inside are some lovely carved capitals and a mural of 'The Three Dead Kings' telling the story of three young men reminded by three dead men of the importance of saving their souls. 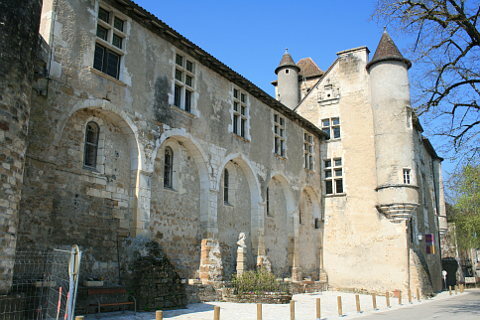 If you visit the cloister (for a small fee) you will see the famous 15th century sculpture of the Miseau Tombeau. The cloister is half Romanesque and half Gothic and the church and cloister date back to the 11th century. 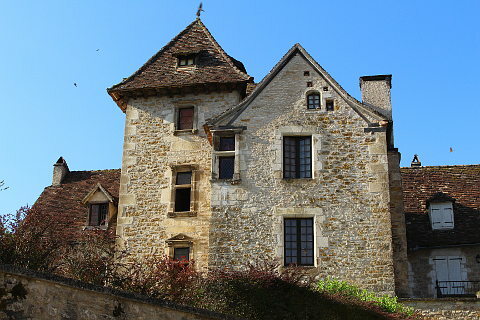 A house with a turret, opposite the church was once the porter's lodge and provided hospitality for pilgrims on their way to or from Rocamadour. 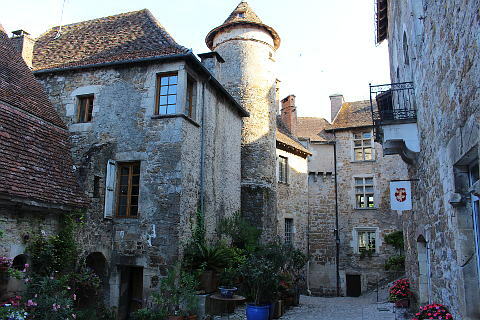 Carennac's castle which runs along the edge of the church, was built in the 16th century as were some of the large houses in the village. 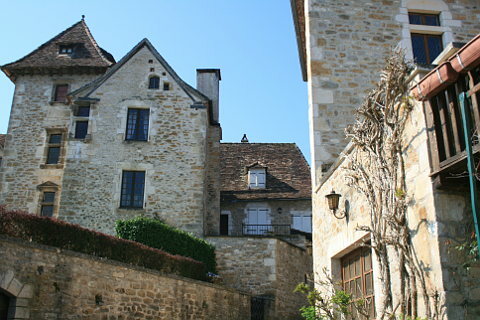 The castle was once the home of Francois Fenelon who wrote 'The Adventures of Telemachus'. The book tells the story of Telemachus, son of Ulysses in Homer's Odyssey. 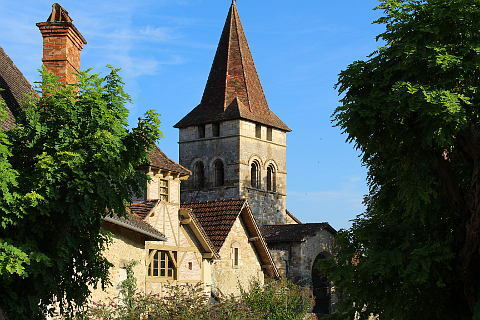 It was recognised by Fenelon's contempories as an attack on the then King of France, Louis XIV. 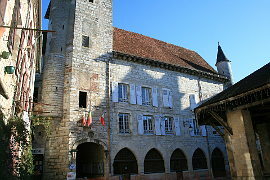 Inside the castle is a permanent exhibition about the rich architecture and history of Carennac. 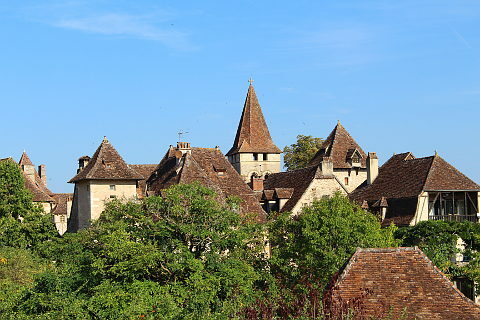 It also offers an opportunity to enter the castle and admire the lovely painted ceiling of the salle d'apparat (the ceremonial hall). 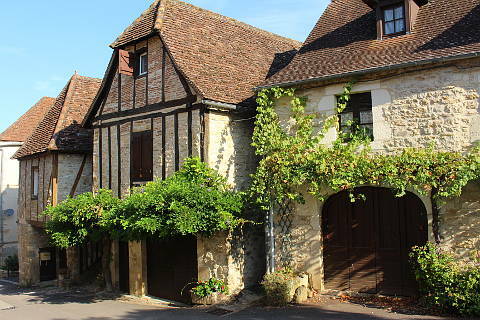 The streets surrounding Carennac's Court du Prieure are full of charming 15th and 16th century stone houses and the River Dordogne runs just below the village. 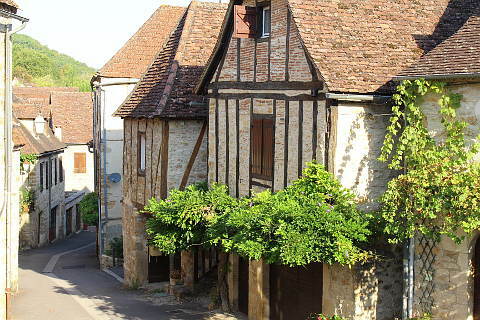 Many of the Renaissance houses have beautiful sculpted windows and each one is a bit different to its neighbour but all built in beautiful local stone with terracotta roofs giving the village a very harmonious feel. 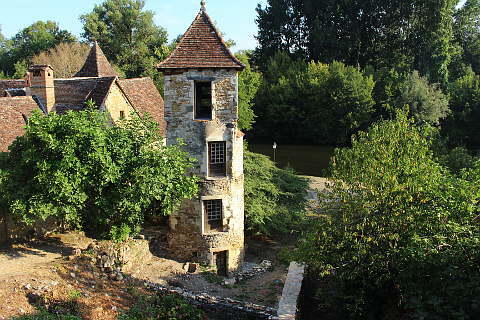 Out the other side from the river runs the Hermitage canal, one of the Dordogne's channels and this too is surrounded by lovely houses. 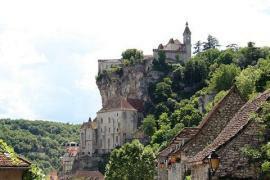 Carennac always holds its main town festival the first Sunday after August the 15th and this is a good time to visit. Market day is Tuesday afternoon during the summer season. 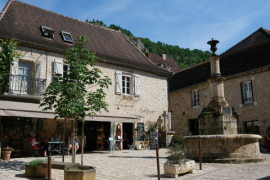 This is quite unusual as markets are almost always in the morning in the Dordogne area. 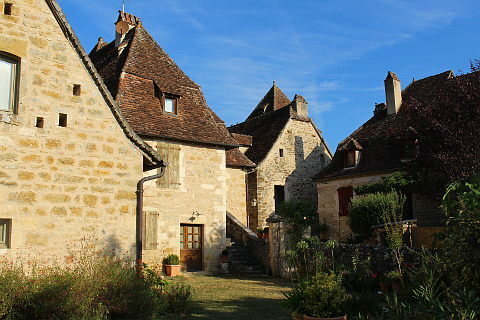 Carennac is in the Lot department and is close to the other most beautiful villages of Loubressac and Curemonte. 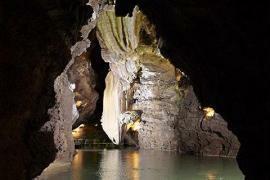 It is also close the the wonderful caves of the Gouffre de Padirac and the pilgrimage town of Rocamadour.